For some reason, one of my original three posts for the site, Eris Enlightenment, something I first posted here 4 1/2 years ago, is showing up at the top of every feed. And for some reason everybody wants to comment on it. I don’t know how this happened. I was updating categories for different posts and I updated that post, but I did the same for about fifty others and this is the only one that has an issue. This is causing me to have a lot of traffic problems. A lot of sites that send me traffic list my most recent post and how long ago it was made. This not only puts me at the bottom of those lists, but makes it look like I haven’t updated in four years. Hopefully this post will fix some of the feed problems so people know my site is currently being updated. Unfortunately this means that my fae helper spell post probably won’t get as much exposure as it would have if it were allowed to stay at the top of my feed a little longer. And if you see the Eris post in your feed, it’s over 4 years old. Initially I was planning to post a glam-break spell I have that, although very powerful, is of very limited use to a magician who is able to cast it. But when Natalie brought up the fact that she wanted to meet fairies it reminded me of my Fae Helper Evocation, which is a fairly useful spell. Different types of fae have different types of abilities. For instance pixies are very good at casting glamours and trolls tend to be very good at guarding an entry way or portal. With the literally thousands of different types of fae out there, there’s quite a bit that fae are capable of. But fae spirits do have very real limitations. After all they are not magical genies that can grant any wish. They aren’t even relatively powerful spirits when compared to things like arch-angels or the Goetic spirits. Also keep in mind that fae may not always understand things in the same way you and I do, and they may have trouble comprehending what you tell them to do. For instance if you get a fae to find “treasure” for you, in my experience you usually end up with garbage. It isn’t that the fae is intentionally doing this, it’s just that it may consider things like shiny buttons, cool rocks, and even discarded candy wrappers as treasure. A lot of fae don’t even understand the concept of money, and some of the ones I’ve met that do don’t understand the concept of paper money, and think of money as being something like a coin whose value is derived from the fact that it is made with a precious metal. Another common problem working with fae is their attention span. Fae are creatures of desire who live in the current moment. Most fae however desire to help people they deem worthy (usually people who are innocent, who are very good natured, who are parent like, or who treat them very well). The problem is they tend to be easily distracted and can quickly forget what they’re doing and go off to do something else that looks like fun. One of the best tricks for working with a fae is to ask it to do a job it would normally find enjoyable instead of something that will bore it. If the fae likes what it’s doing, you have a better chance of success. Unfortunately this isn’t foolproof. A fae creature still might get distracted. Because of that, this spell works through Venus. Venus is one of the deities that is highly revered by most fae. She is also the goddess of desire, which gives her quite a bit of power over the fae. By casting the spell through Venus you can keep a fae focused on the task at hand so he or she doesn’t get distracted. But this does mean that you have to work through Venus to do the spell, and so you should ask and receive permission from Venus first. And Venus is a deity who I have found is relatively strict in what she allows you to do with her power, even if you have strong connections to her. Also the fae summoned through this spell are brought forth under the protection of Venus. To attempt to hurt, kill, capture, punish, or otherwise harm these spirits would be an affront to Venus and she may seek vengeance against you. This spell doesn’t summon forth a single fae creature. It summons forth a lot of fae, pretty much whatever can be convinced to come, to work within the general area where you cast it. It’s easily modified to only summon forth a specific type of fae, but as it’s normally cast it will bring in all different kinds, and you may find some strange ones that normally would never be found in your area. The large number of fae creatures work like a dragnet usually covering the city (or general area) where you live. This makes them very good at doing things like finding a place where you can buy something in your town, finding a specific person and bringing them to you, or finding your car keys. As you can guess, the larger the area you want covered, the less effective the spell will be. However you could conceivably have the spell cover the entire world (though I’ve never tried this). The spell also lasts for about half a day. So when you’re thinking about what you want to do with this spell, try to figure out something that can be realistically accomplished in half a day. Asking the fae to say, guard your house for the next week, is unrealistic since the spell only lasts for half a day. On a final note, when you use this spell to summon forth general fae, you may bring forth dark fae who might try to harm or kill you. Usually these are not very powerful spirits, but the situation is made worse by the fact that they are under Venus’ protection and so you can’t really harm them. If this happens, I’d suggest concentrating on purely defensive measures to protect yourself and those in your home. If absolutely necessary, try to work out a non-violent way to remove the fae from the general area or limit their abilities without doing any permanent harm or trauma to them. Once they’re away from you, don’t concern yourself with them anymore. After all it is their right to do as they wish, and from my experiences Venus will look after them and take an interest in what they’re up to. For more information on how to build an altar, see my FAQ on the subject. You can use a makeshift altar for the spell, but for the best results I suggest having a permanent altar. Fortunately for me, my Venetian altar was one of the very first one I ever built. In theory you don’t need to have a special fae knife for this ritual. If you have a normal magic knife you use, it could theoretically be used and work just fine. But I also find that fae really like having their own knife, and it shows a good deal of respect on your part (which wins you some favor with them) when you actually buy a knife especially for them. Knives aren’t that expensive, so I really suggest getting one. I also suggest getting one that is, for one reason or another, fae like. 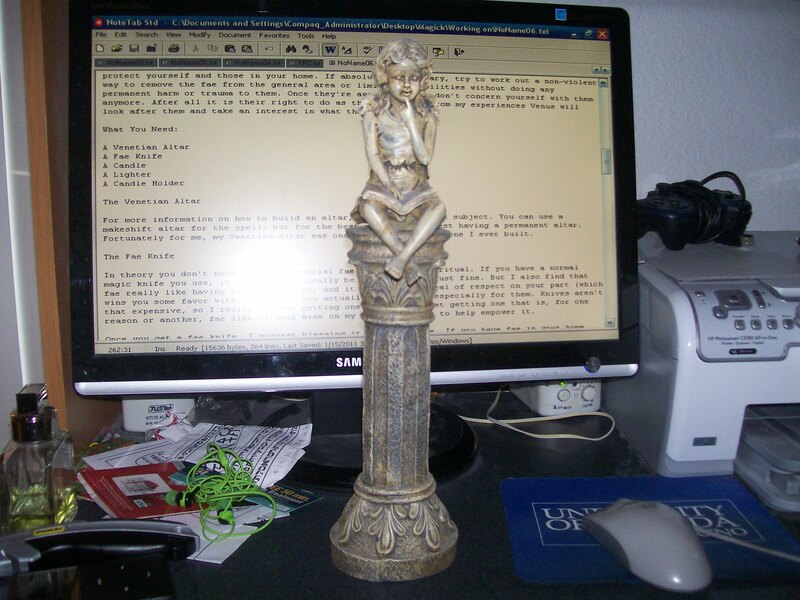 I keep mine on my Venetian altar to help empower it. Once you get a fae knife, I suggest blessing it under the fae. 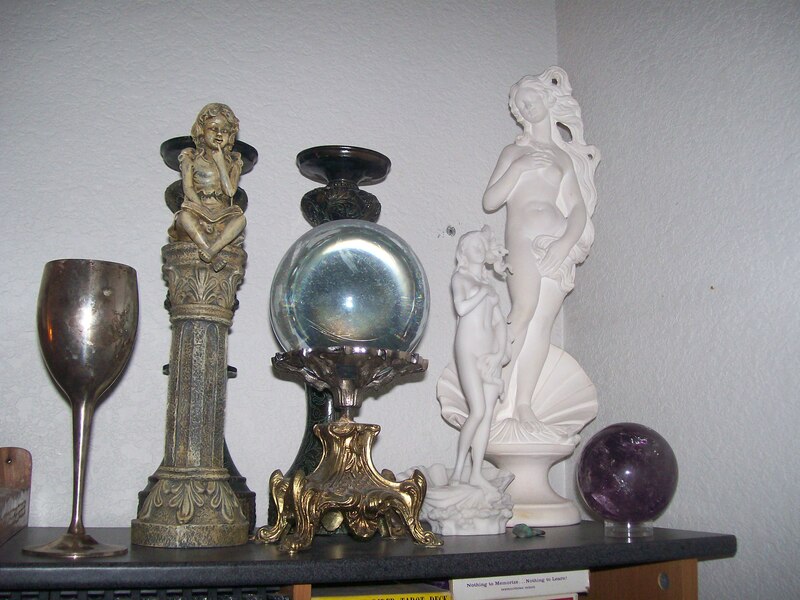 If you have fae in your home, you can always ask them to do it. Or you can have Venus bless it as a knife dedicated to the fae. You can also use this spell to summon forth fae to bless your knife. A plain white unscented candle will work fine for this spell. I suggest finding a candle that will take 8-12 hours to burn, since the spell lasts for as long as the candle is burning. If the candle doesn’t burn at least eight hours, you may find that the fae didn’t have enough time to do what you wanted them to. Meanwhile if it lasts for more than twelve hours it usually becomes a pain to have to watch over the candle for that long and at the same time you’re going to have lots of fae coming and going through your house while the spell is active. 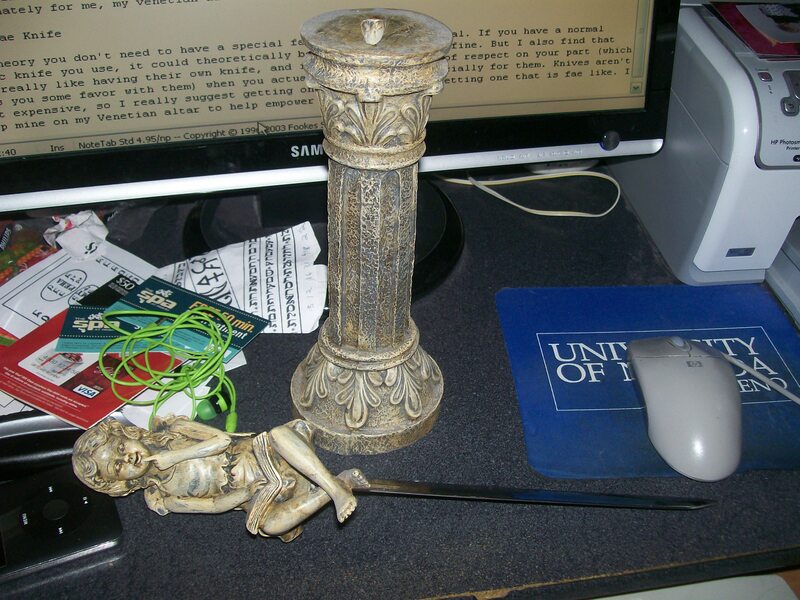 As you can guess, the lighter and candle holder are just things that you need in order to use a candle. Basically the spell uses the power of your fae knife to cut open a portal and then uses the power of Venus to summon fae through it to complete a task for you. 1. To begin, ask Venus for permission for what you are about to do. If you want more information on communing with the gods, see this post. You may wish to spend some time allowing Venus’ energy to flow through you. 2. Next the candle needs to be blessed under Venus. It’s recommended that the magician be in communion with Venus for the blessing. 3. Hold the candle up to the Venetian alter. Say, “Venus bless this candle so that while it burns it will bring forth fae to this place and that by your will they will be directed to [and say what it is you want the fae to do]. 4. Allow the Venetian energy to flow through you and into the candle. Afterwards place the candle on top of the candle holder on the Venetian alter. 6. To do this slice the sword vertically in the air near the Venetian altar. While doing this, visualize the blade slicing through reality as if it were a paper wall and revealing what lies behind it. You need to be able to imagine that it isn’t just air you’re slicing through, but that this paper wall exists where you are cutting, and this wall is what separates reality from everything else, this world from all other worlds, and where we are from every other point in this world. The veil is being pierced here, is being broken here, cut through, and a portal is being created. 7. Light the candle while saying, “By Venus’s power, as this candle burns let fae be drawn to this place, through my portal and by any other means, to complete my task as per Venus’s will and under her protection.” Alternatively you may also, if you wish, repeat the task which the fae are to complete in the above statement, although this isn’t necessary. 8. The spell will last so long as the candle burns. I suggest allowing the candle to burn itself out even if you have already seen results. Fae will still be coming and going during this period as a result of the spell. After the spell is finished be sure to thank Venus and show her your gratitude. -The spell is easy to modify in order to bring forth only a specific type of fae, although in my experience you usually get less fae this way. If you are familiar with the type of fae and their energy you just have to align the portal with that energy so it only draws fae from a specific world or place largely populated by that type. -You can also modify the way in which the portal is created. In particular, if a strong portal already exists where you are casting the spell you may wish to just modify that portal to suit your needs rather than create a new one. -The spell can also be modified to be cast without Venus’s aid, and doing so will give you a lot more leeway in what you can do. However doing so will also net you fewer fae, and you won’t have the benefit of Venus directing their desires so they will complete your task. -The fae who respond to your request have all volunteered to help you for their own reasons. Don’t worry about immorally controlling the fae or taking advantage of them since each has come of their own free will. -As stated earlier, any of the fae that come are under the protection of Venus as the candle burns. To harm them in any way or have any sort of malice towards them is an affront to Venus. -Likewise Venus will protect the fae in her own way while they are working on the mission you gave them. -A friend of mine called me upset because a friend of hers had called her while he was driving and after taking a large amount of pills in a suicide attempt. After convincing him to get out of the car he passed out while still on the phone. Afterwards she heard several people discussing robbing him while he was unconscious before someone hung up the phone. No one knew where he was and several friends and family members had tried calling him with no response. First I got his number and tried calling it, but it went to voicemail. Afterwards I cast this spell with the instruction that the fae were to find him and then get him to return my call. Three hours later (now the middle of the night) he was woken up, very hung-over, took out is phone and called back only me without knowing who I was. I explained who I was and after talking to him verified that he was okay and in a safe place and then let him go so he could pass back out. I actually originally created the spell for this purpose. -I once used a modified version of this spell to summon gnomes into a local business in order to take out their computer system, which they did. After doing that they got into the AC system and tore that up as well (that was a bonus as I never intended it to happen). -I’ve used this spell to have the fae help me find a place that has a video game I wanted on release day because I didn’t preorder it. -I’ve also used this spell to find lost car keys. -If you’re looking for a relationship and going out to a place where you expect to meet other single people, you can give the fae a description of what you’re looking for and then have them draw those people to where you’ll be so you’ll have a chance to meet them. Be very specific about the physical traits you want though and don’t rely on general terms like attractive or pretty. Even a word like thin is open to too much interpretation for me to recommend using it here without further clarification. I’ve worked with fae a lot in the past and over the years I’ve had many living in my home with me for periods of time, and that’s because I’m very compatible with them and I like them a lot, they amuse me to no end. I’ve had a lot of success working with fae too, and a lot of that has to do with the way I treat them. You’ll find you’ll have much more success working with fae if you give them the respect they deserve and are due. Most magician’s fall into one of two categories in how they view fae. The first kind reveres and even worships them as if they were gods, some even believing they are gods. These people have usually been tricked by fae. We aren’t even going to deal with these people. The second type of magician tends to think of fae as silly, weak, possibly annoying, and largely useless spirits. They tend to show fae very little respect and believe they deserve even less. The fae often times have special fun with these types of magicians and attempts to use the fae often times end disastrously. In truth fae deserve a lot of respect. Yes they are fun loving and can be silly or slaves to their desires, and many are prone to causing mischief. But most types of fae would be considered higher realm spirits. Most embody positive emotions like joy and love and happiness. And many can be valiant and fiercely loyal. Many fae find themselves trying to protect or avenge the innocent when they have been wronged. They end up doing whatever they can to protect an abused child from their parent or an abused animal from their owner. I’m personally far from innocent, but I’ve had a pixie come to my aid in a spiritual fight before. The fact that pixies are not particularly strong spirits doesn’t make the act any less valiant, in my opinion it makes it more so. Fae, for the most part, are noble and good creatures. They are capable and have a good deal of potential, and they do a lot of good in this world. I’m not saying we should worship them, or serve them, or put them on a pedestal and make them out to be something far greater than what they truly are. But they shouldn’t be looked down upon and they should be given the respect they are due. From my experiences, fae are generally very appreciative of this, especially since many magicians and spirits don’t give them this sort of respect. Magicians who treat fae in this manner have much better relationships with them and have much greater success working with them. Be sure to let me know if you have any problems with performing any of the steps in the ritual so I can go back and clarify or rewrite it. I’m particularly concerned about step 6 and may go back and elaborate on this some more, break more of it down into actual ritual, and maybe expand it into several stepts. 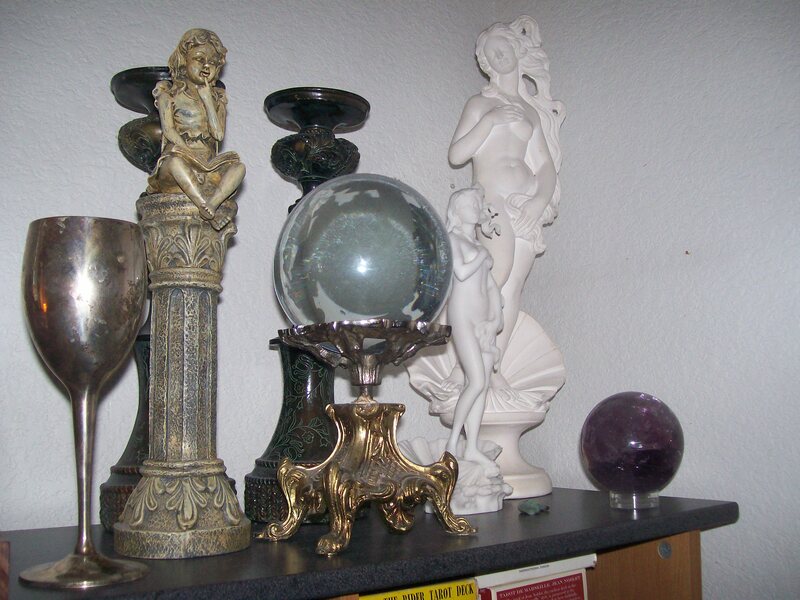 You are currently browsing the Rob's Magick Blog blog archives for January, 2011.